Ein einfacher Taschenrechner ohne unnötigenSchnick-Schnack. A simple calculator withno unnecessary frills. Ein einfacher Taschenrechner ohne unnötigenSchnick-Schnack.A simple calculator withno unnecessary frills. Mathematical calculator with percentages, memory, history, largedigits and innovation continuous lighting buttons for avoidmistakes. 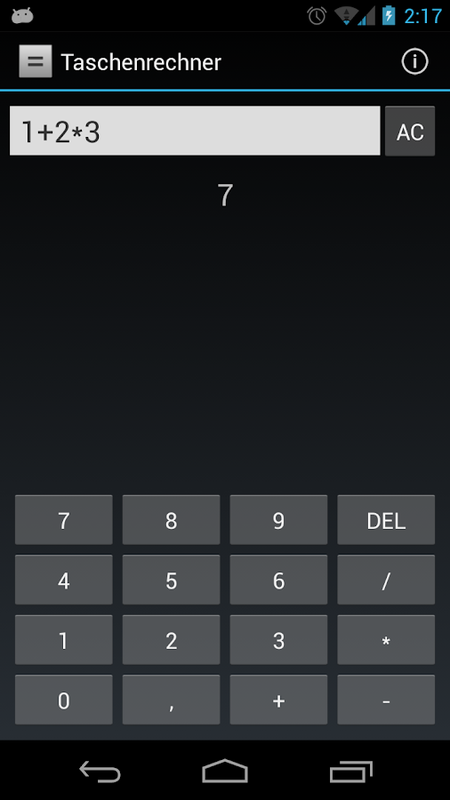 This is a simple calculator app. Easy to use with large buttons. Scientific calculator for math, physics, economics and many more!With most important mathematical functions: - arithmetic andtrigonometric functions - store multiple values in memory -universal, physical and technical constants - history ofcalculations - float, fixed and scientific mode Very easy and fasttool for school, college and work!